Congratulations to Roger Ogden for receiving the 2016 Times-Picayune Loving Cup! by Stirling PropertiesPublished August 28, 2017 Leave a Comment on Congratulations to Roger Ogden for receiving the 2016 Times-Picayune Loving Cup! On behalf of Stirling Properties, we would like to congratulate Roger Ogden for receiving the prestigious Times-Picayune Loving Cup. He is truly worthy of such an esteemed award that serves to honor his lifelong service to our community. 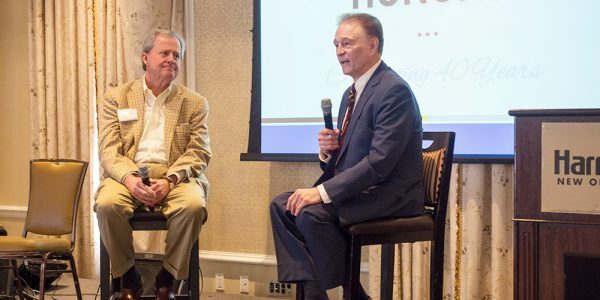 As one of the founders of our company, along with Jimmy Maurin (pictured above), Roger has helped to shape this community and transform the commercial real estate industry—and we are grateful for all that he has done. His passion, vision, and leadership have significantly contributed to the success of our city, state, and the entire region. As impressive as his extensive business credentials are, even more impressive is what he has accomplished through his commitment and generosity to the myriad of civic, cultural, and philanthropic causes in our area. “I have had the distinct privilege of working with Roger for many years. I have also shared the opportunity to work with him on several boards and projects throughout the region. I know well the tireless commitment he gives to each and the passion he brings to the table. I also know he is driven to make the world around him a better place through his efforts,” said Marty Mayer, President & CEO of Stirling Properties. Roger is a remarkable individual and he has definitely earned his place among such an extraordinary list of people who have made a lasting impact on us all. Congratulations, Roger, on this well-deserved honor!